UPDATE March 10, 2019: This post currently only applies to Azure Data Lake Storage Gen1. Direct support from Power BI (or Azure Analysis Services) is not yet supported for Azure Data Lake Storage Gen2. Let's say you have data in Azure Data Lake Store (ADLS) that you want to report directly from in Power BI. You might be doing this for early exploratory data efforts, or you might have some curated data which has been prepared in the data lake for analysis tools such as Power BI. The screen shots & functionality discussed for ADLS and Power BI are from early May 2018. We're going to be pulling the data files from the RawData subfolders into Power BI. What do you need to be able to retrieve ADLS data into Power BI? Read and execute permissions to the data stored in ADLS. I talked about permissions in this blog post. 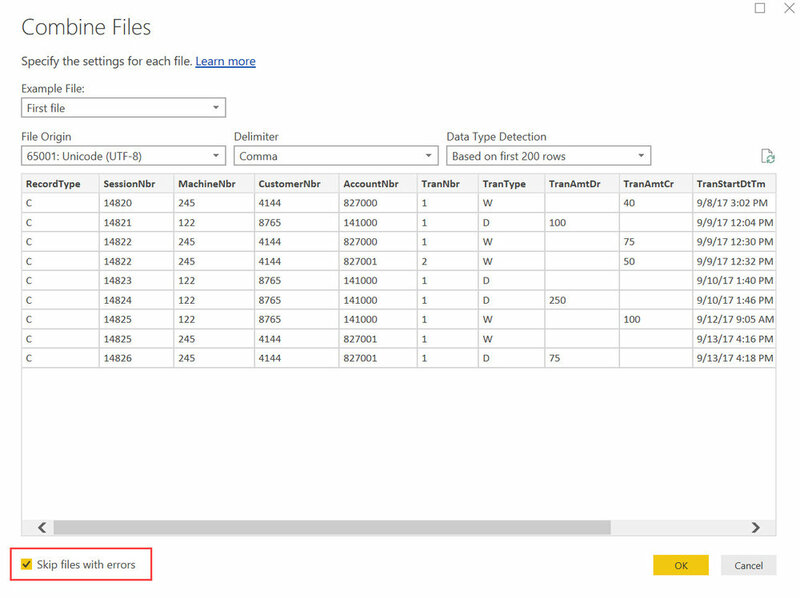 The source file(s) need a format which has reliable structure that Power BI can understand. If you're combining multiple files (such as all 3 shown in the screenshot above), they need to have the same structure/file layout for each file. Power BI is pretty smart about this, so if you're missing a column in one file that's present in the other files, it can cope with something simple like that from what I've seen. The rule of thumb when designing a data lake is to use the same data structure within each folder, so hopefully varying data formats aren't a problem--otherwise you'll have to cleanse & standardize the data before it can be analyzed. What can you query from ADLS? 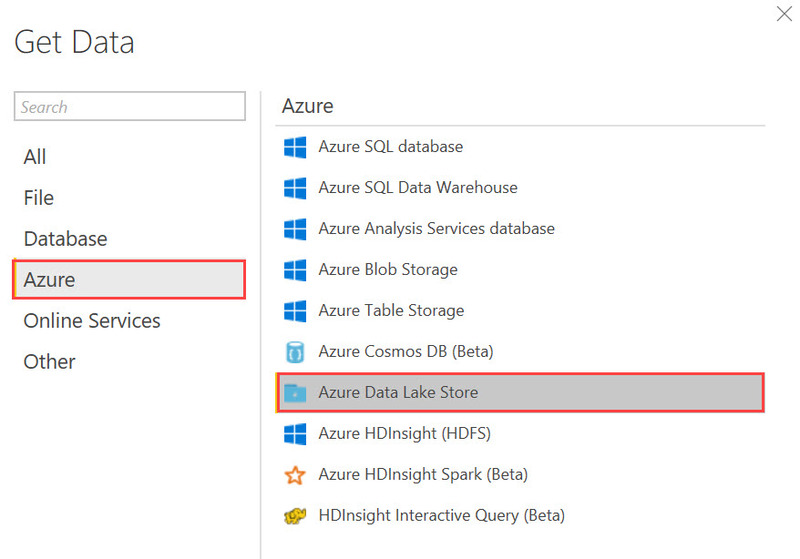 You can connect to the data stored in Azure Data Lake Store. What you *cannot* connect to currently is the data stored in the Catalog tables/views/stored procedures within Azure Data Lake Analytics (hopefully connectivity to the ADLA Catalog objects from tools other than U-SQL is available soon--you can vote for Power BI connectivity to the Catalog on this UserVoice suggestion). You're not sending a U-SQL query here. Rather, we're sending a web API request to an endpoint. With an ADLS data source, you have to import the data into Power BI Desktop. There is no option for DirectQuery. https:// is a WebHDFS-compatible endpoint which allows integration of the ADL Store with open source projects and other languages. adl:// is the “AzureDataLakeFilesystem” which is also secure, and provides additional performance enhancements on top of WebHDFS. At this point, you can Close & Apply. Carry on with fine-tuning the data model properties and creating visuals. Connecting to a folder is helpful when you have numerous files you want to consolidate. In a data lake, it's common to have data partitioned (into subfolders) by date or other logical ways to store the data incrementally. Your steps above might differ a bit depending on your folder structure. When combining files, be sure to choose "Skip files with errors." I had some null rows along with the binary file list which Power BI saw as file errors so it failed when trying to complete a full data refresh. The error was "Failed to save modifications to the server. The parameter is expected to be of type Text.Type or Binary.Type." I believe what this meant was the sample query & parameter it used in the Query Editor to figure out the metadata was choking on those null values. I'm not certain where the null rows came from, but choosing "Skip files with errors" solved the issue (or you could filter out null values in the Content.Content column shown above). A gateway is not needed in the Power BI Service since it's pulling from an Azure service. Now for the bad news. The OAuth2 protocol relies on access tokens, and those tokens expire at regular intervals. (I'm currently testing this with a new refresh schedule created yesterday; I'll update this post as soon as I have verified what the current expiration interval is--thankfully it is longer than it used to be.) Once the refresh fails due to token expiration, you'll have to edit credentials in the dataset properties. Usually our way around this issue, like when Azure Data Factory needs to access ADLS, is to use an Azure application (service principal) for authentication, but that's not currently supported either. Depending on your quantity of files and/or size of files in the data lake, the data refresh may take a bit of time. One https GET request is sent by Power BI per file to retrieve data.